I have a fb debate with a physician-friend who supports PDu30's violent style in fighting the drugs war. See again PDu30 language last May 04, 2017: “I told them that once you get involved in drugs I will kill you. I will ambush you, poison you, bomb you, whatever. Steal your wife from you..."
I respect my friend's medical views and his healthcare policy views, he is a brilliant physician and surgeon. But his political views related to the drugs war are lousy, so I am blogging our debate. c. state-tolerated murders (PNP knows the murderers and gangs but little or zero investigation as the murders produce the same result as ordered by PDu30. Below are some of his comments which I think are commonly uttered by many supporters and followers of PDu30. Then my reply/comments, slightly revised from the original fb exchange. 1. "were you this vocal during the past admins". No, except the Maguindanao massacre. 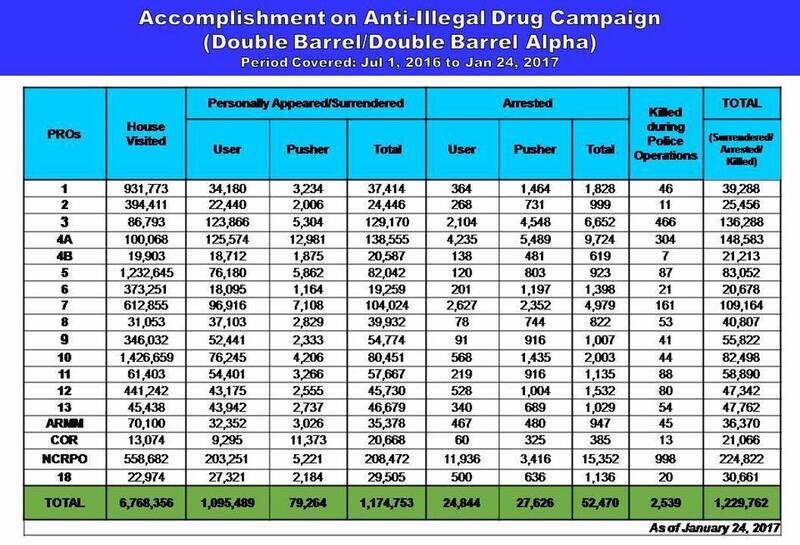 Under the past administrations -- Cory Aquino, FV Ramos, Erap Estrada, Gloria Arroyo and BSA3/Pnoy -- there were no murders by the thousands on drugs war. Most murders in the past administrations were pol. murders, ordinary crimes, etc. Here we are talking about drug-related murders with explicit exhortation by a President to kill-murder-ambush-poison people suspected to be involved in drugs. 2. "are those purported extra-judicial killings (EJKs) indeed EJKs". 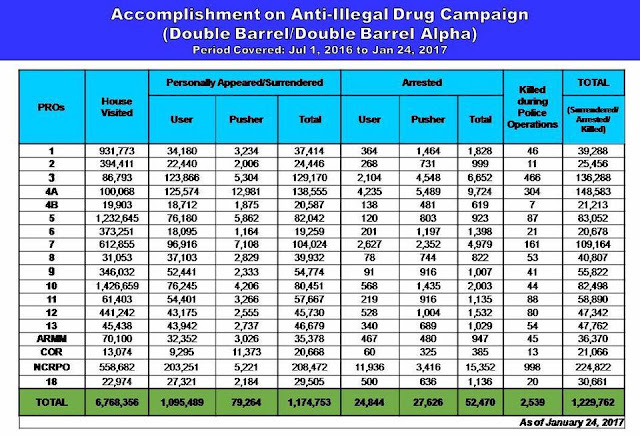 PNP data showed that from July 01, 2016 to January 24, 2017 anti-drugs campaign, they killed 2,500+ and so this falls under (a) state-sponsored murders. The 5k+ other murders by vigilantes/gangs but some of them are actually policemen, like the incident in Mindoro in October 2016. Two hooded men killed a woman at night, local police were able to catch the murderers within minutes, and they were active duty policemen from another municipality. Since there is legal, judicial killing by the state in the form of death penalty via lethal injection, then those drugs-related murders can be considered as EJKs. 3. "shy away from drugs, surrender or be killed." Singapore, Malaysia, etc. have the same warning and law for people to "shy away from drugs" but their main tool is legal, due process, not kill-ambush-poison-bomb order from a President who has very little or zero respect for due process. In SG or MY and other countries, the due process itself that can be worse than death penalty for drug offenses. Being put in courts, reported in media, put in prison, brought to the courts again for another hearing, public reporting, execution if proven guilty -- the humiliation can be worse than death. And that scares potential drug offenders. 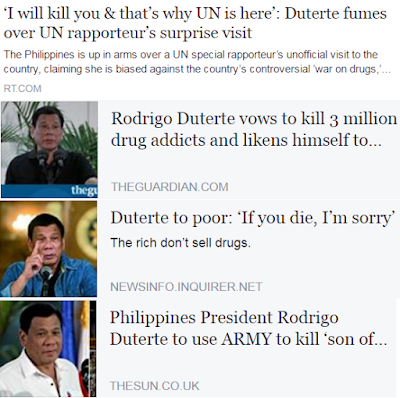 and yet why there is no explicit, categorical condemnation of Du30's explicit, categorical pronouncement of kill-ambush-poison-bomb people in drugs? 5. “whatever compassion you have for these drug users and pushers, you render to the sick who couldn't afford healthcare.” I have no compassion for real pushers and users, but give them due process, to defend themselves if they are indeed guilty or innocent and simply falsely accused. As mentioned above, SG, MY, ID, etc. also have death penalties for drug offenders, similar to PH laws. The difference is that there is due process there; here, little or no due process, short cut kill-ambush-poison-bomb order as pronounced by the President himself. 6. “we're better off sana with Mar?” This as political paranoia. The thread is about Du30's drug war, not Mar, not Marcos, not any other personality or sector. 7. "mukhang sobrang sacred sa yo ng due process" because (i) many murdered people accused of being drug users/pushers may be innocent, simply falsely accused. Pero tapos na, dedo na sila. And because (ii) that is what SG, MY, ID, etc are doing to control drug crimes without killing thousands. SG with death penalty but due process to drug offenders has low drugs incidence compared to PH with kill-murder-bomb them policy of Du30. 8. "policy criticism is the same as criticizing the person." Wrong. I like PDu30 infra policy on build-build-build, I like his questioning the UN climate drama, etc. My criticism is mainly on his kill-murder-ambush-bomb people in drugs war. Have allowance for those falsely accused as drug users/pushers and not just murder them. Dead people cannot defend themselves. 9. "your choice is the right one for us." Wrong, it's not me 'ordering' the PDu30 government to "go through due process". Far out. It's the existing laws, the criminal code, the various Republic Acts, that are ordering this and other administrations that they should respect these laws. 10. "di naman pwedeng wala tayong presidente." Another pol. paranoia. I did not make any statement, explicit or implicit, that we should have no President, or that Du30 should be replaced without constitutional process or be bombed to eradication, nada. Du30 should stay as elected President until 2022 unless the impeachment case against him in Congress prospers. We focus on Du30's kill-ambush-bomb mentality and policy and it should stop. Go the due-process route. Police to get plenty of evidence against suspected drug pushers and users. If evidence is strong, make arrest, bring to jail, go to the courts, wait for court decision. If innocent, set them free. If guilty, death penalty via lethal injection. This hypothetical case becomes policy pronouncement. "police can kill hundreds of civilians without criminal liability." wow. Implying no need for police training to avoid killing civilians in dealing with criminals. Just kill the criminals, kill the civilians too, no criminal liability, magaleeeng na logic. For now, nothing can stop PDu30 from his wild and insane remarks on drugs war. Sometime last year he said something like "annihilate 3M drug users... I'll be like Hitler". And last week, he said kill-poison-bomb. Tomorrow he might say "kill-burn-grill-eat their liver". And PDu30 supporters will clap and applaud him.